Fishing nets are among the most important tools for fly-fishing, catch and release or any other type of fishing for that matter. This article is a review of some of the best fishing net for kayak fishing. It will help you narrow down your choices and give you an idea of things to look out for. We have included some important considerations to help you make an easy choice of which kayak fishing net is just right for you. This fishing net’s most standout feature is its clear virtually invisible net which disappears underwater. However, that’s not the only thing to love about this net. 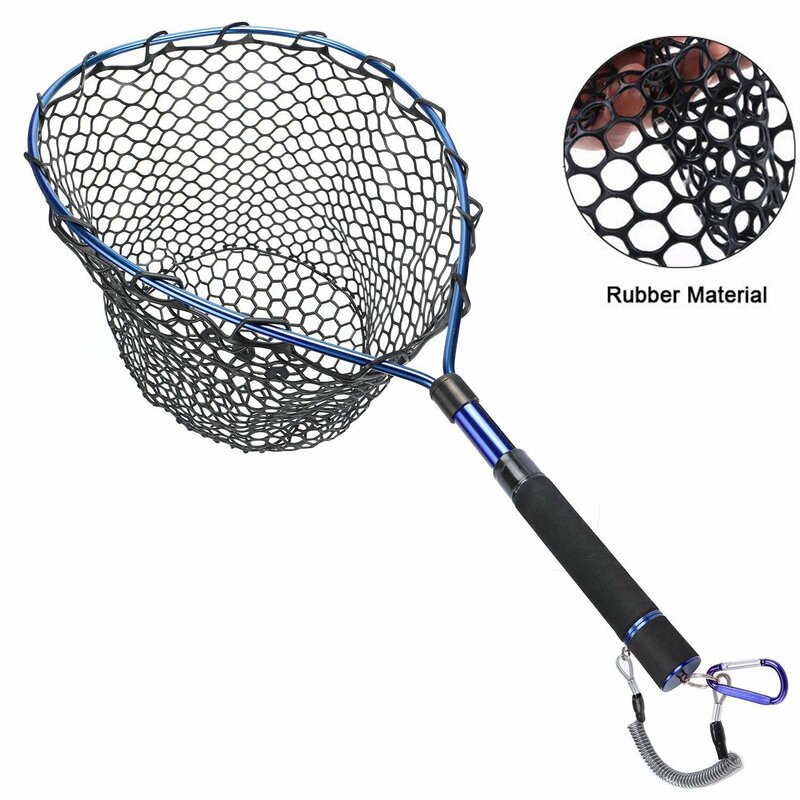 The net is made from a soft rubberized material that is designed not to spook the fish. In addition to this, it also doesn’t tangle up or rot. This net also comes with features that increase its application and versatility. Its frame is made from a blend of hardwood and bamboo which makes it strong and sturdy. Additionally, it features a highly durable carabiner magnetic slip for quick release. It also comes with Heavy Duty Stretchable spring-cord. PLUSINNO fishing Net is a high-quality net that is designed to be your ideal fly fishing net. This net is made from premium materials which make it perfectly elastic. It is constructed from a combination of high-density carbon fiber and fiberglass for added durability. To top it all, this net has a waterproof coating which prevents it from taking it too much water which can cause damage. 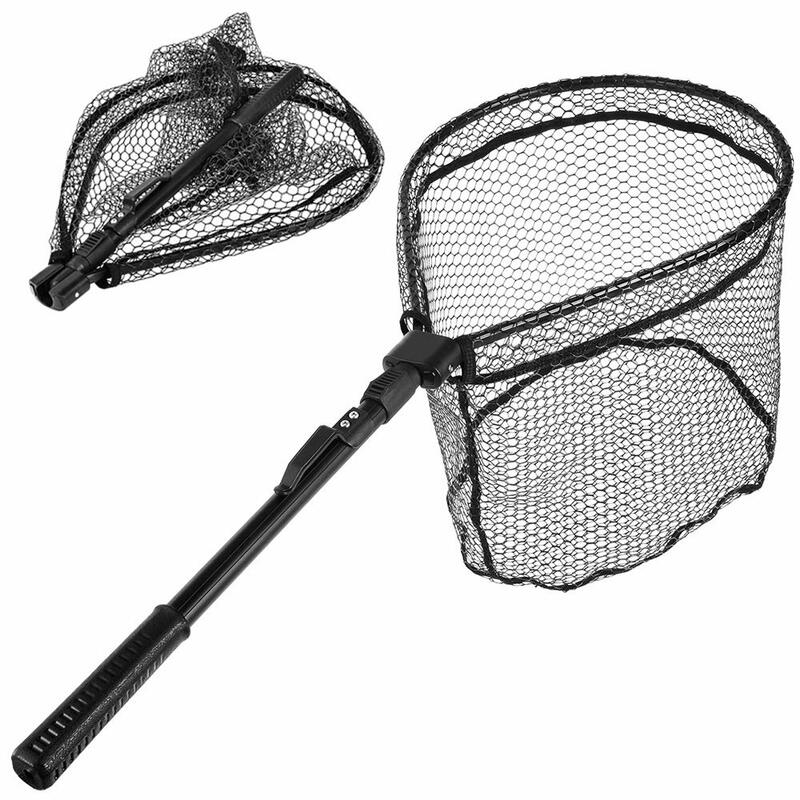 You will also find this landing net absolutely easy to carry. First, it is super-lightweight. In addition to this, it has a foldable pole which solves the problem of carrying it about conveniently. Finally, it comes with a belt clip which makes it quite easy to transport. 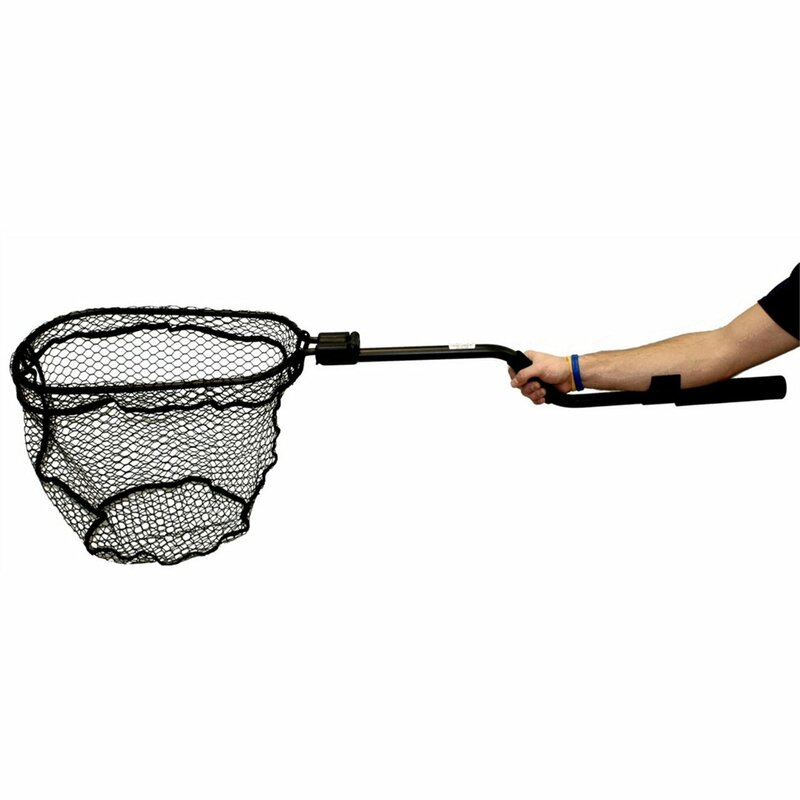 This portable net is perfect for fishing for trout and medium-sized bass. It is made from soft Black knotless nylon micro mesh which holds even the smallest fish gently without getting entangled. 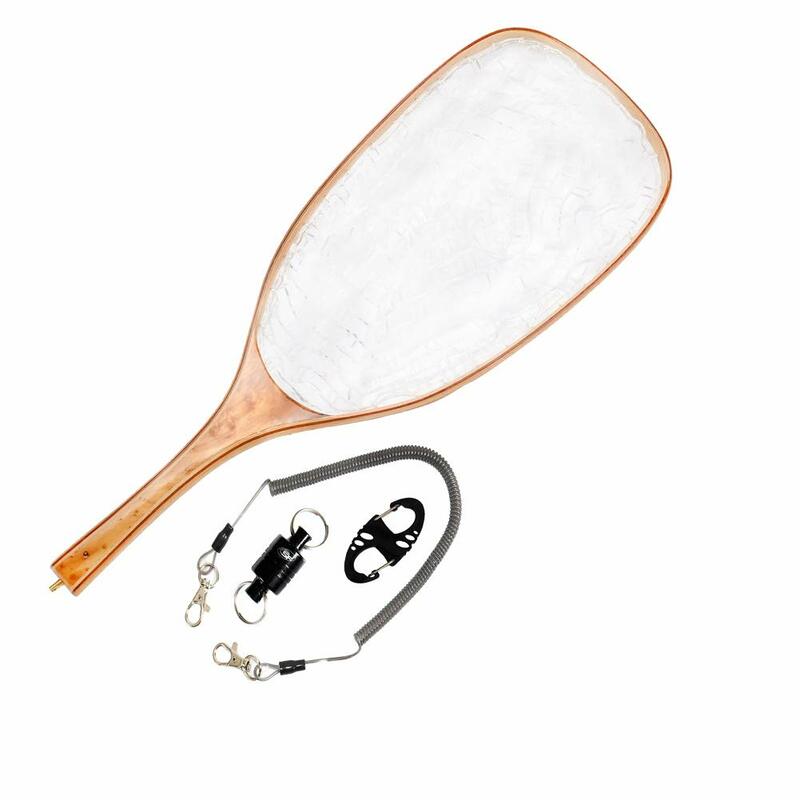 This Aluminum Landing net features an ergonomic handle that makes it easy for kayak or boat fishing. Its plastic non-slip grip helps you to fish without the risk of your net slipping off. It also has a safety cord on the handle which you can easily wrap around your wrist. 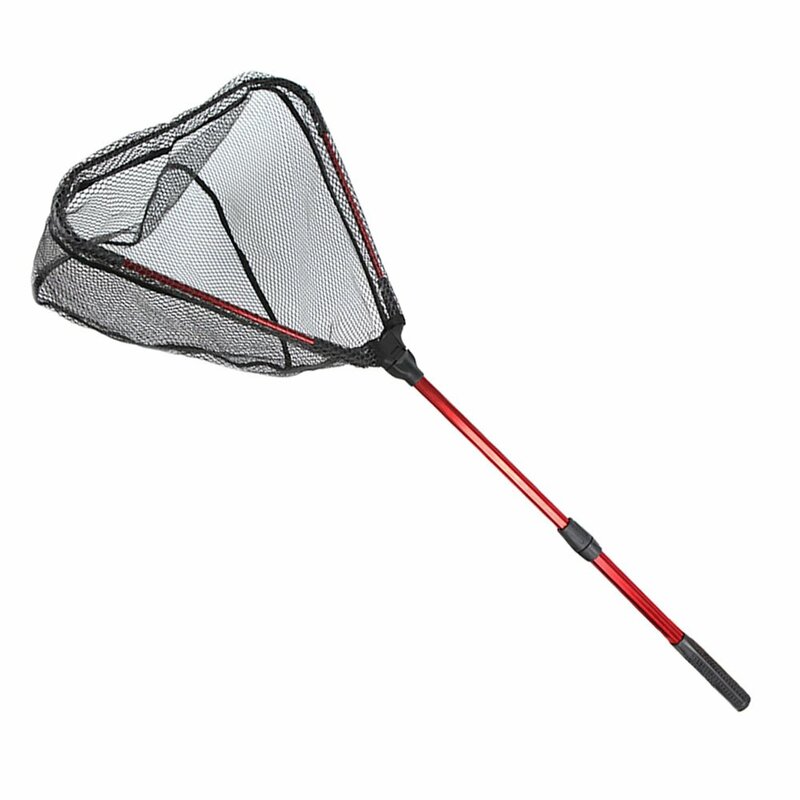 This fly fishing aluminum landing net has a 100% knotless netting. This helps to protect the fish from sharp hooks. 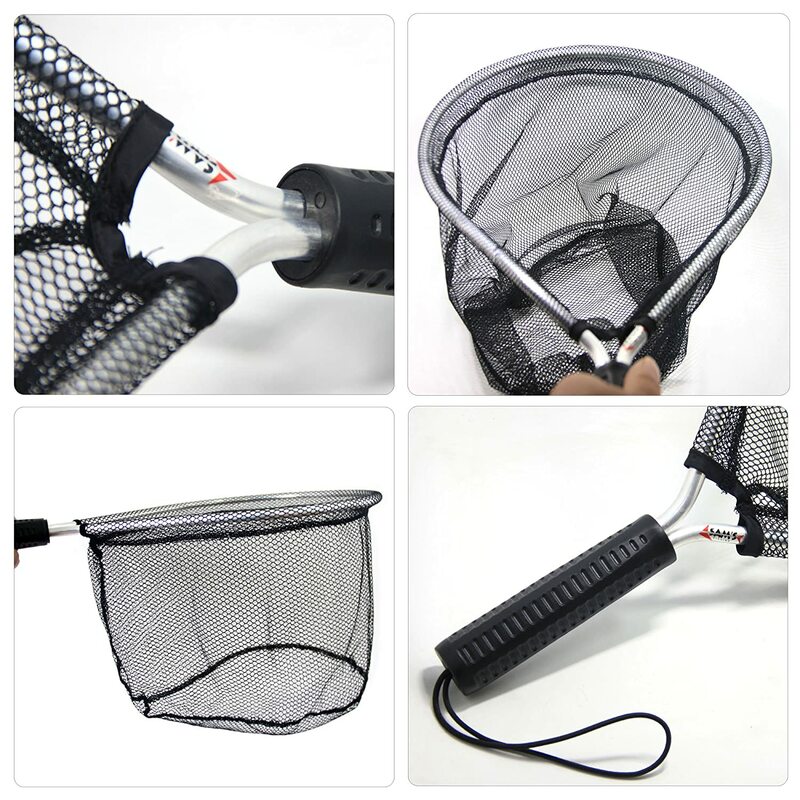 The fishnet also features a corrosion resistant aluminum hoop and handle, with sturdy construction that is able to withstand stress. The net also comes with a rubber mesh which further increases its durability since it is resistant to rot and mildew and at the same time quite easy to maintain. The Windaze fly fishing net is designed to be ergonomic and easy to use. The aluminum handle features a non-slip grip which is quite comfortable and helps you to get a secure grip on the net so that it doesn’t slip off. The MelkTemn foldable fishing net is designed for easy transportation and storage when not in use. It also guarantees an ergonomic fishing experience. The net is comfortably lightweight and won't constitute an added load to your fishing geats. At the same time, it is designed to be quite sturdy as well. Thanks to a durable nylon mesh, this mesh stays strong and solid with use. A waterproof coating ensures that it doesn’t get waterlogged which might lead to bacteria build-up and terrible odor. Additionally, this net’s handle is built to purpose. It is comfortable to use and at the same time designed to be skid resistant. This Net is foldable. Thus you can easily stow it away when not in use. If you are looking for a good quality, fish-friendly net with a guarantee of optimal usability this is a highly recommended product. 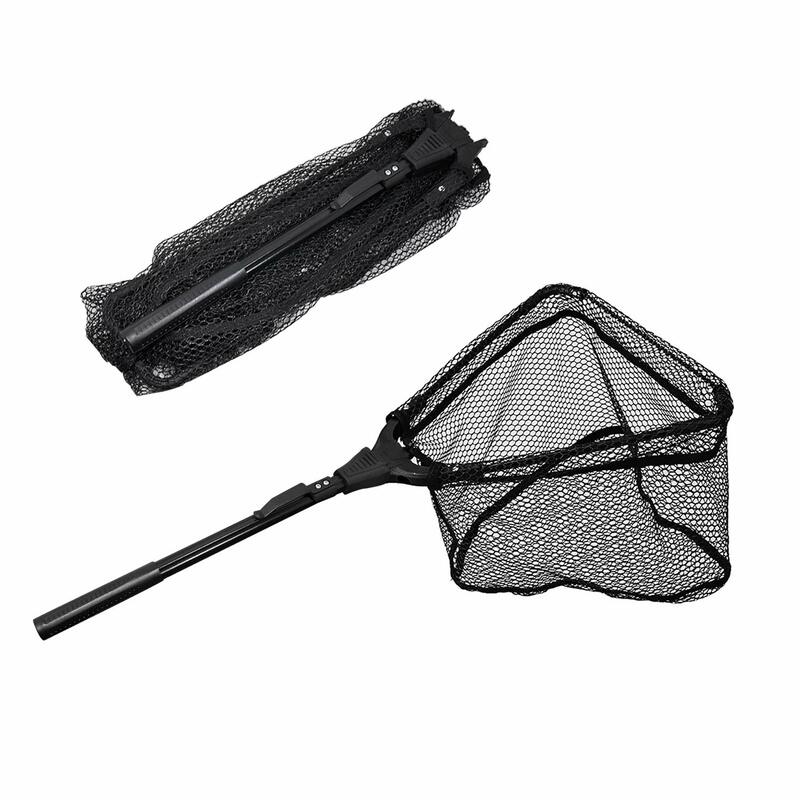 This retractable, telescopic fishing net has been designed to be compact for easy storage. Yet it folds out into a size big enough to hold your catch. This versatile length can serve quite a wide range of fishing purposes. However, it is particularly designed to be make kayaking or boat fishing super-convenient. 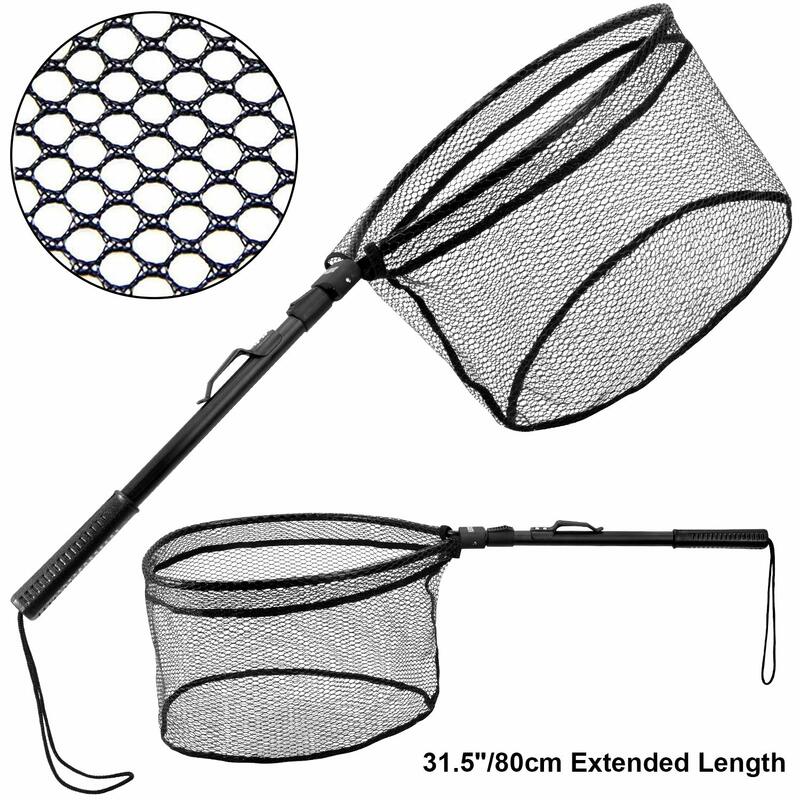 The handle of this net can extend to up to 63'' in length. Also, it comes with a non-slip rubber coating ith groove that helps to improve grip and makes the handle quite sturdy as well. The top quality fishing net is perfect for both all levels of anglers whether pro or beginner. The extensible forearm grip on this net isn’t something you see on many landing nets. It further adds to the beauty and ergonomics of this net. The forearm grip is designed for added stability and control thus making it easier to land your catch. This revolutionary fishing tool features a scuff guard. It also has a reinforced hem all of which contributes to its sturdy build. There are also extra features on the net that further adds to its functionality and improves durability. This includes the fabric loops, a zippered lower leg and inner leg with water-resistant zippers and a lot more. Probably, almost every fisherman like a fishing net that is both foldable and flexible. Actually, that is exactly what makes TONG JI Fishing Net a great item to add to your fishing gear. It is a Non-Absorbent and waterproof net that will prevent waterlogging, Odor uptake or Bacteria. A rotary switch is another feature that we loved in this net. It is quite easy to lock and fasten. Additionally, the high-density nylon mesh renders the net long-lasting giving you the value for your money. Also, its aluminum pole is retractable skid-resistant and pretty comfortable to handle. The TONG JI Fishing net is easy to store and carry and will solve the hassle of storing your net. Lastly, it is flexible and can be used in river fishing, sea fishing, boat fishing and even lake fishing. If you are interested in kayak fishing particularly for minnow and trout fishing then you need to consider this. It features a retractable aluminum pole and high-density nylon mesh that makes it ultralight. The aluminum pole is another makes this fishing net the best as it makes it durable. Not only is the durability enough but also the user experience that the handle offers. On that, RUNATURE Fishing Landing Net wins it! More so, we tried it with up to 5 kg of weight and it perfectly worked. Actually, it is ideal for crab dip net. It is a collapsible yet with greater space and stability. Thanks to its triangular design. Another notable feature is that the RUNATURE Fishing Landing Net can be applied in both freshwater and saltwater. That means you won't have to worry about the effects of saltwater when using it. Kayak fishing nets are built to purpose. The right one will make your day out on the water quite stress less and make fishing very convenient. On the other hand, a bad quality length will make kayak fishing totally frustrating. To find the best kayak fishing net, here are some features you should look out for. Fishing nets has two basic parts; the net and the handle. By all standards, a good quality length will have both of these parts in top-notch shape with details finely refined for ergonomics. As far as the net is concerned, the most important factors to consider are the shape, size and the material of the mesh. The four most common net shapes are circular, oval, flat bottom and teardrop. While we it wouldn’t be right to say that one is superior to the other, you should know that which one you go for depends on the type of fishing you intend to do. Again, this is not a question of which size is the best or not. Finding the perfectly sized fishing net depends almost entirely on the type of fish you are looking for. 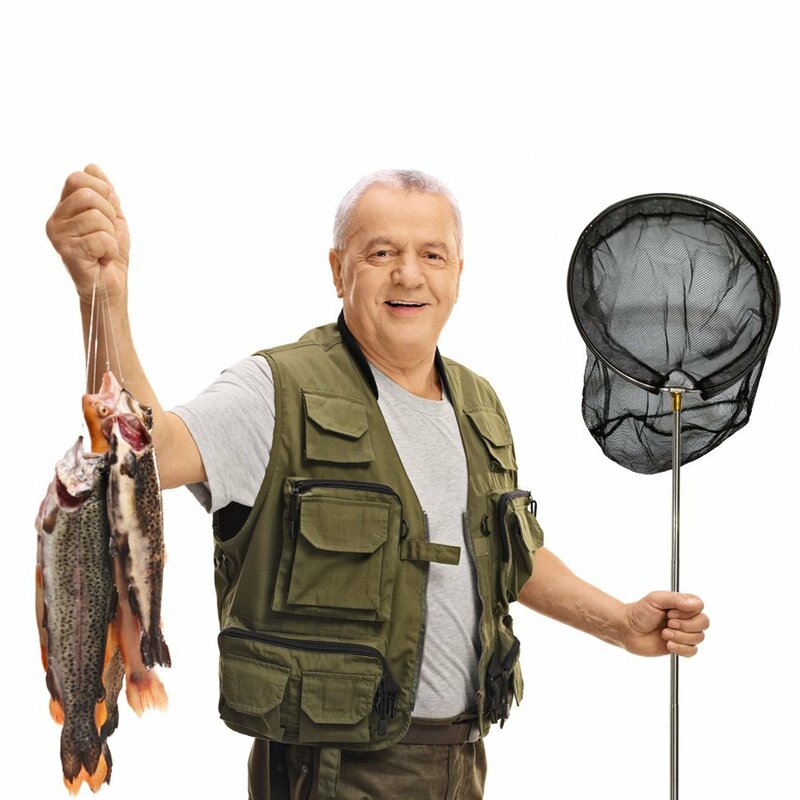 Trout nets, for example, are meant to be short with stumpy handles and large opening, for bass fishing you might want to go for something larger and wider. In terms of mesh material your fishing mesh can either be made of rubber, nylon or nylon coated cord. Nylon mesh is generally inexpensive and is known to be quite durable. This is perhaps why it is the most popular material. However, for catch and release fishing you might want to go for something easy on the fish and that is where nylon coated and rubber mesh comes in. Why do I need a fishing net? A fishing net is an important tool in the angler’s arsenal. It helps an angler brings order to the chaos of a catch. When a fish is caught at the end of the line, dropping it in the net helps to bring it under control safely. The net is where the angler drops the fish before removing the hook and dropping it into the tub or back into the water. My net is broken. Can I simply replace the bag instead of changing the whole net? Yet, it is possible to replace the bag of the net instead of buying a new net. The process of doing this varies from one manufacturer to the other. Can I get a net that is safe for the fish? During your search for the best fishing nets for kayak, you will come across several great quality kayak fishing nets. Choosing the best among them starts with you knowing what exactly you want and the important features to look out for. This article has covered some of the best of types out there as well as the important tips that will help you pick the right one for you. Outdoorsbase is a participant in the Amazon Services LLC Associates Program, an affiliate advertising program designed to provide a means for us to earn fees by linking to Amazon.com and affiliated sites.